Yu-Gi-Oh! VRAINS episode 22: "The Deleted"
Makoto Kimishima (君島マコト Kimishima Makoto) is a character appearing in the Yu-Gi-Oh! VRAINS anime. Makoto has black hair, and black eyes. 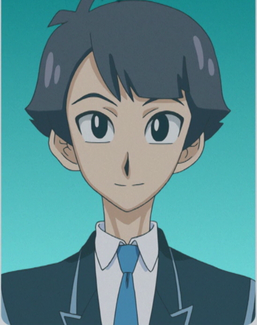 In Link Vrains, he has the same hairstyle, except blond. His outfit is yellow, green and black, somewhat similar to the colors of Playmaker (Yusaku Fujiki)'s outfit.